Electric motorcycle maker Zero staged a 24-hour publicity event last weekend, "24 Hours of Electricross," in San Jose, California, and set two world records. 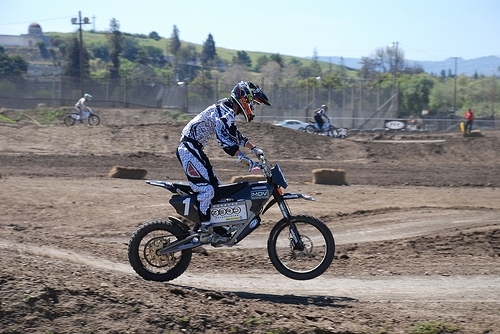 The one-make motocross race earned Guinness World Records for the longest distance covered by an electric bike in 24 hours (500 miles) and the biggest all-electric motorcycle race, with 50 riders on 10 Zero motorcycles. Zero is a California company that makes electric motocrossers equivalent to 250 cc motorcycles and has just released a street-legal version. The 24-hour event was held to promote the product’s reliability and power. The winning team ran 1,015 laps at the 408MX track. Even more interesting than the power of these bikes is the sound. As they race around the track, you can hear the clatter of chains, but little else. For more on the Zero event, see zeromotorcycles.com and for the full story and some eye-and-ear-opening video, see Wired. Sounds almost like a roller coaster or amusement park ride.